Today, smartphones are more accessible than they've ever been before. For $100 or less, you can take home a brand-new handset that's more than ready to get you online, connect you with all your favorite social media, and even snap some decent-looking photos. While those entry-level options are great for users on tight budgets, there's no shortage of more expensive models for shoppers able to spend a little more, offering increasingly feature-rich packages with bigger, high-res screens, advanced imaging systems, smoother performance, and eye-catching designs. At the very far end of the spectrum, we've seen the availability of insanely expensive “boutique” phones for years now, and while they've offered extravagance through the use of premium materials like leather, gold, and even gemstones, more often than not all that fanciness was just skin deep, and the phones themselves were a bit rubbish. But this year, we're finally seeing high-end mass-market smartphones start to push up against – and even over – the $1,000 mark. 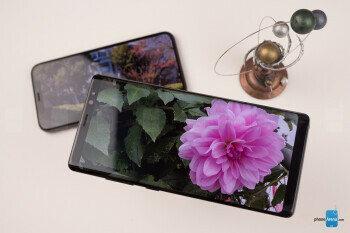 While not as ostentatiously showy as the blinged-out luxury models of years past, these new super-phones are nonetheless solidly outfitted, bringing their users some of the most cutting-edge mobile tech available. When you're spending this much on a phone, you're understandably going to expect that every corner of the experience is going to be no more than a stone's throw away from perfection, but even at this lofty level, we still find pluses and minuses that can make one handset seem slightly more appealing than its competition. Today we're breaking down what you can expect from the two most high-profile, super-expensive smartphones around: this summer's Samsung Galaxy Note 8, and the just-released Apple iPhone X. As we've remarked before, 2017 is destined to go down in smartphone history as the year when the look of smartphones changed dramatically, all thanks to the availability of extra-wide screens that push bezels to their thinnest yet, and deliver phones whose faces are nearly all display. This trend's been kicking around since the early-year flagship pair of the LG G6 and Samsung Galaxy S8, but we're already seeing refinements for this second wave of models, of which both the Note 8 and iPhone X are members. Of the two, the Note 8 is easily the larger phone: taller, wider, thicker and heavier than the iPhone X. And at least in terms of physical makeup, Apple's _phone_ has more in common with the GS8 than its phablet-sized cousin. That has the potential to cause some frustration, especially when it comes to pricing, as while the Note 8 is up there with the iPhone X in this ultra-premium space, the GS8 can be had for just 75 percent of the iPhone's price. But continuing to focus on design, it's impossible to ignore the Note 8's sheer height. 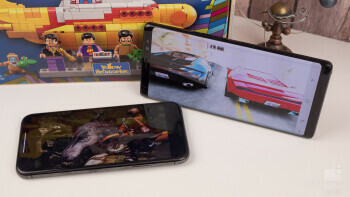 While the extra-wide screen shape of both phones helps keep left-to-right access within an easy stretch of your thumb, the Note 8 demands a bit more juggling to get to its top edge – and when that's a requirement for accessing your quick settings and notifications, the phone's size starts to become a bit of a liability. On the bottom of both phones, you’ll find speakers as well as charging/data ports, but the Note 8 one-ups the iPhone X by also throwing in an analog headphone jack. Somehow, Samsung also finds room for the phone's S Pen stylus down there, too. On the right side of each handset we have the power/sleep button, which has grown in size on the iPhone X for no apparent reason. Volume controls live over on the left, joined by the do-not-disturb switch on the iPhone, and the dedicated Bixby button on the Note. Around back, each of these handsets shows off their dual cameras, but while Samsung's are for all intents and purposes flush-mounted, with only a hint of a border lip separating them from the rest of the Note 8's back, Apple's got a pretty pronounced camera bump on the iPhone X. And while Apple keeps its familiar top-corner camera placement, the X shakes up the side-by-side arrangement of iPhone Plus models in favor of a top-to-bottom layout here. We also have to talk about what's not here, and both these handsets ditch their familiar hardware home buttons. Samsung got that ball rolling back with the GS8, and the Note 8 offers more of the same, including the repositioning of the handset's fingerprint scanner to live with the camera hardware on the phone's rear. That's not ideal placement, if only due to how high up the scanner lies and what a stretch it can be to reach. While Apple has similarly dropped its home button, there's no effort here to relocate the fingerprint scanner, instead relying solely on the new Face ID scanner for biometric authentication – we'll talk about the user experience that offers in just a bit. Samsung may be bigger and feature curved edges, but Apple can't be beat for brightness and overall appeal. For two screens that sound like they have so much in common, the displays on the Note 8 and iPhone X are a world apart. Let's at least start by laying the similarities out on the table: they're both exceptionally widescreen panels, with an aspect ratio of 18.5:9 for Samsung, and closer to 19.5:9 for Apple. Both are OLED panels, a first for Apple, and both feature curved corners, a feature that's rapidly become synonymous with super-wide displays. 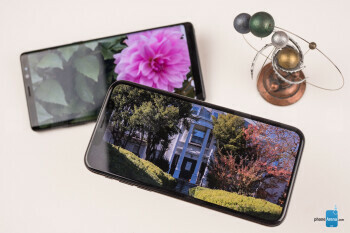 For two screens that are so off the beaten path, that's a lot that's being shared, but even with these similarities, the two manufacturers have found no shortage of ways to make their screens stand out. Samsung gives the Note 8 a curved-edge screen, bending ever so slightly over the long sides of the phablet's body. While there's still a bit of _phone_ body forming a bezel even with these curved edges, it's much more minor than we see on the iPhone. 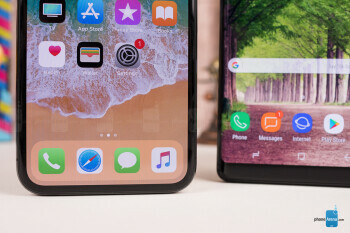 Even if that's a win for Samsung, Apple scores much smaller top and bottom bezels – though admittedly thanks to the “cheat” of its screen's top notch, housing the phone's front-facing camera, earpiece, and Face ID hardware. But even with that protrusion, Apple scores a bit of a win in terms of aesthetics by keeping the bezels around its screen remarkably consistent. The effect is subtle but powerful: this doesn't look like a phone with a screen on it, but like a phone that was built around its screen. There are some consequences to this design decision – primarily that the clipped, curved corners are of a much wider radius than on the Note 8, and you lose that much more screen real estate as a result – but it just looks so nice and clean that we doubt many users will get hung up on that. 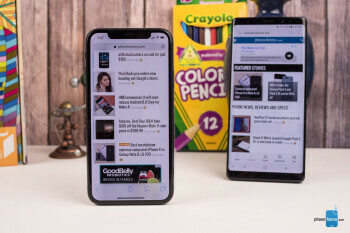 Both of these phones are capable of some largely accurate color output, but Samsung scores some extra points for just how configurable its screen output is, with users able to choose between not just a number of preset color-rendering modes, but also to further tweak color balance to their liking. On the flip side, Apple's True Tone system aims to automate color adjustments – keeping things easy but offering less control. Apple gets a major win for screen brightness, with the iPhone X's max output significantly brighter than the Note 8's – and that's true to an even further extent when you're keeping brightness under manual control. Of the two, the Note 8 is easily the larger phone: taller, wider, thicker and heavier than the iPhone X. And at least in terms of physical makeup, Apple's phone has more in common with the GS8 than its phablet-sized cousin. That has the potential to cause some frustration, especially when it comes to pricing, as while the Note 8 is up there with the iPhone X in this ultra-premium space, the GS8 can be had for just 75 percent of the iPhone's price. For two screens that are so off the beaten path, that's a lot that's being shared, but even with these similarities, the two manufacturers have found no shortage of ways to make their screens stand out. Samsung gives the Note 8 a curved-edge screen, bending ever so slightly over the long sides of the phablet's body. While there's still a bit of phone body forming a bezel even with these curved edges, it's much more minor than we see on the iPhone. Apple adjusts to life without the home button, while both phones try their hand at advanced biometrics. When we're looking at one Android phone and one iOS device, it can be tricky to avoid getting sucked into a discussion of the merits and shortcomings of each of those platforms – and while that still has the potential to be an interesting read, it would be doing a disservice to the unique elements of these specific devices. Instead, we're going to look at the ways these two handsets make their user experiences stand out from the rest of the pack. With the Note 8, obviously, that means using Samsung's S Pen stylus. The implementation here builds off what we (briefly) saw last year with the Note 7, fleshing out Air Command with new functionality, and allowing users to jot down quick notes with screen-off menus. There's also Samsung's own Bixby assistant, integrating with the S Pen and even featuring a dedicated hardware button. While we can't deny that Bixby can do a lot of cool features, especially when using the Note 8's camera to identify things through Bixby Vision, it really hasn't resonated with users in a strong enough way to make it a big selling point, and it feels like most of the conversation we've heard around it has been how to avoid accidentally pressing that Bixby button (which you finally can, thanks to a software update). On the iPhone X, the uniqueness instead comes from how we deal with navigating the system without a home button. As you might expect, that can take a little getting used to: the swiping up from the bottom to access the home screen is intuitive enough, but the swipe-halfway-for-multitasking is little trickier to nail. Expect to under-swipe and over-swipe for your first few days of ownership before you really nail it. We've also got to talk about biometric security on these devices. Apple has famously ditched Touch ID in favor of the new face-scanning Face ID system, which uses a front-facing TrueDepth camera with an IR structured-light projector (like an Xbox Kinect) to map the contours of your head. Samsung's got its own suite of biometric systems, from bog-standard fingerprint scanning, to iris scanning (with its IR illuminator), to even more face scanning – just a bit less technically sophisticated than Apple's. The good news for Apple is that Face ID works great: it's fast, accurate, and feels quite secure. Our only real complaint is that while it unlocks the phone, you still need to swipe up on the (now unlocked) lock screen to access things. It feels like an unnecessary extra step at times, but at least you quickly get used to it. Samsung's face unlock automatically jumps to your home screen once your face is recognized, which is nice – but it's also less robust than Apple's solution, and reportedly easier to fake-out. It’s also way slower and less convenient, so you may be better off avoiding it altogether. Iris scanning may be more secure, but it's got its own problems. Though it can be set up to work right from the lock screen without further interaction (which we like), it struggles to work with users who wear glasses (which we hate). It’s also slow and rather finicky. Fingerprint scanning continues to be fast and reliable, but its ease-of-use is hurt this year due to just how far up the scanner's located on the Note 8's back, making reaching it a serious stretch. Next-gen chips make these both speed demons, but Apple's A11 Bionic is still untouchable. As is only befitting $1,000 smartphone flagships, these handsets are powered by some of the highest-end kit around. 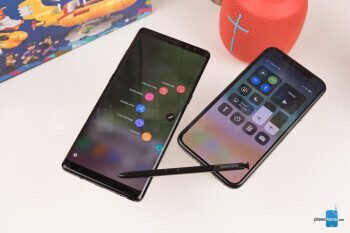 That means a Snapdragon 835 in the Note 8 (at least for this US version we're looking at here – international models are also available with Samsung's own Exynos chips) and an Apple A11 Bionic in the iPhone X.
Subjectively, either of these mobile application platforms are ready to give you all the processing power you'll need for any take you can throw at them. They're both blazingly fast, and deliver some of the smoothest, most responsive smartphone experiences you can get. 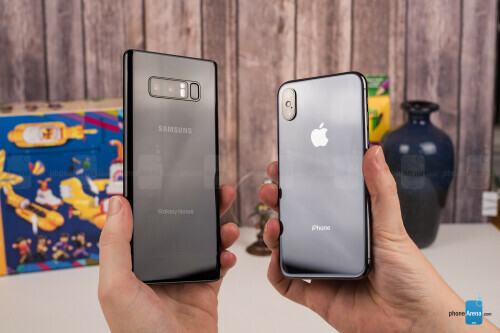 But we also crave some hard data, and subjecting each of these phones to a battery of benchmark tests, it's clear that Apple's phone has a solid lead over Samsung, besting the Note 8 in literally every test we threw at it. While that's an undeniable win for Apple, you're going to be hard-pressed to find a situation where the Note 8 feels slow. Samsung's got lead on Apple when it comes to memory, and the Note 8's 6GB of RAM is straight-up double what we get in the 3GB iPhone X. But these platforms are just so different in terms of their memory demands and how they handle multitasking that it's hazardous to attempt a direct comparison. Instead, like the processor-speed consideration, the key takeaway here is that both phones have all the memory they're going to need. 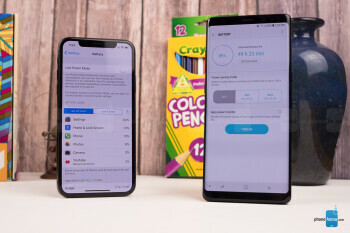 Both also do quite well in the storage department, and their 64GB base level is just what we'd expect to see when paying this kind of money for phones. Apple makes it a little easier to pick up an iPhone X with even more internal storage (while higher-capacity Note 8s are reserved for international markets), but Samsung still ends up as the winner here, due to the innate flexibility of offering support for microSD expansion. A seriously close match delivers both high-quality images and an impressive assortment of shooting options. With the Note 8, Samsung ups its flagship game to enter the world of dual cameras; for Apple with the iPhone X, dual cameras may be a comfortable choice, but the company's still innovating with its camera hardware. Both these systems have a lot in common: they both involve a pair of 12MP sensors, one telephoto, one wide-angle, and both those lenses are outfitted with optical stabilization on each – a bit of a coup. Aperture size is also comparable between the two phones. But just because we're looking at similar hardware doesn't necessarily mean we should expect the same image quality out of handsets, with image processing just as important as the cameras themselves. 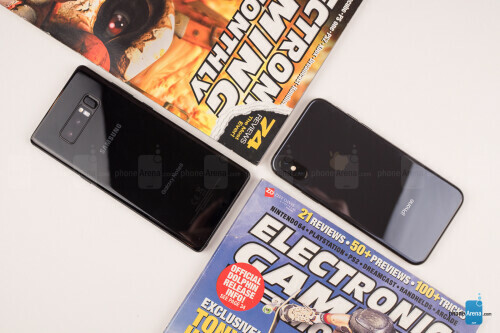 The story around front involves slightly more variety, as Samsung goes with an 8MP sensor with autofocus, while Apple employs a 7MP TrueDepth camera – meaning that it uses that Face ID tech to gather depth information along with the photo itself. Will either of those options give their respective phones a lead when it comes to imaging? 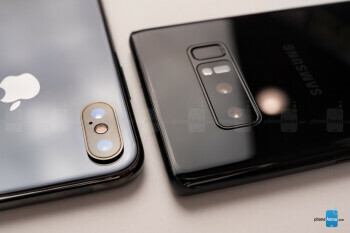 While there can be a lot of variation in what companies mean when they call their cameras “wide-angle” or “telephoto,” the field of view captured by the lenses on these two phones is pleasantly comparable, and both are capable of taking very similarly framed shots. Lucky for us, that makes other comparisons that much easier. In full-auto mode, images shot with the Note 8 show a little less contrast than the iPhone X, tending to result in warmer, more natural-feeling pics. Colors can be slightly bolder on the iPhone X, but the real difference is in terms of contrast, with edges appearing more pronounced. There's certainly going to be a stylistic component to which you prefer, but we feel a little more drawn to the Note 8. Auto-HDR works well on both, with the iPhone getting a little more detail out of bright areas like sky, while we found the Note 8 performing stronger in shadows. Both phones take advantage of their dual cameras to offer a blurred-background bokeh mode. The basic mode there works similarly on both models, but each has their extra way of enhancing the experience: Apple with its portrait-mode lighting effects, including the ability to strip away the background, and Samsung with its dual-capture, letting you switch between wide-angle and telephoto lenses after the fact. Around front, though, Apple really shows its stuff with portrait mode on the TrueDepth camera – such effects may be standard on a growing number of rear cameras, but pulling it off with a front-facer is still quite rare. Here, Apple puts out an admirable first effort – like Google with the Pixel 2s, there's still some wonkiness with edge detection, but when it works it really looks nice. Samsung has its own version of selective focus on the Note 8's front-facer, but Apple's solution feels more effortless. Samsung offers a ton of shooting modes in the Note 8, including both regular video shapes and those optimized for the phone's extra-wide screen. And while Apple has fewer options, it pushes technical limits past Samsung, including a 60fps 4K mode. Both phones have similar limitations, like how they'll let you switch between cameras while filming in lower resolutions and frame rates, but lock you in to one of the other when operating on the higher end of things. In-video refocusing is a little easier on the Note 8, at least for very close-up subjects, while the iPhone X prefers things a little farther away. And while audio sounds clean on both phones, we noticed that it's quite a bit louder on the Note 8. Samsung's more headphone-friendly, but Apple's speakers are second-to-none. 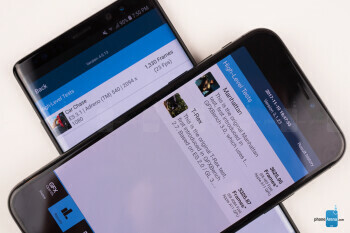 The screens on both these phones are beautiful, and neither struggles with playing back colorful, high-quality video. But there's a pronounced lack of balance when we turn our attention to the audio situation with these handsets. The Note 8's speaker sounds OK, but the stereo speakers on the iPhone X put it to shame; beyond just making the audio sound that much richer and engrossing thanks to the stereo effect, audio on the Apple phone has a more pleasing timbre to it. But while, just given the phones alone, we'd rather listen to audio on the iPhone X, the Note 8 shows more versatility when it comes to using headphones, due mainly to retaining its analog headphone jack. We realize that some users only intend to ever use the headphones that come with their devices, and for them the Lightning EarPods won't do them wrong: they sound as good, if not better than the cherished analog ones, and are just as convenient to use. But for listeners who desire a bit more flexibility, we can't ignore that the Note 8 makes it much easier to swap headphones on a moment's notice, without needing to plan ahead and remember to bring along your analog adapter. It may be a small victory for the Note, but the story of analog headphones isn't over quite yet. After some recent missteps with smartphone voice-call quality, we're happy to say that neither the Note 8 nor the iPhone X exhibit any problems in this area, serious or otherwise: calls are clean and intelligible, without even a hint of interference. We realize that should be a pretty low bar to reach, and shouldn't be rewarding $1,000 phones for hitting it, but rest assured that there's no cause for concern here. 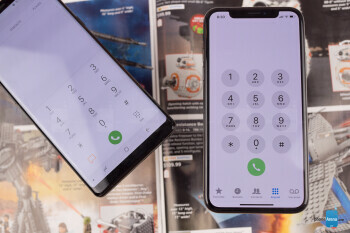 Of the two, the iPhone is slightly more comfortable to use for extended calls, thanks to its slightly narrower build feeling a little less awkward in our hand over the long run – but the Note 8 is also a solid performer in the comfort space, and the iPhone X only just squeezes past it. Solid battery-life showings from each, but Samsung is the easy favorite when it's time to recharge. 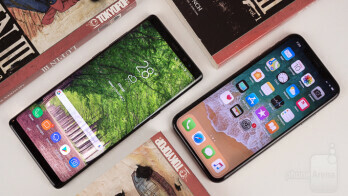 Optimizing power consumption has always been a tricky nut to crack for smartphone manufacturers, and that's all the more true when you're working with big, power-hungry screens like on these two models. Apple's a company that's long managed to do more with less in the battery department, so it's not too surprising to see the iPhone X end up with a relatively conservative 2,700mAh battery. The Galaxy Note 8, meanwhile, gives itself a greater power reserve with its own 3,300mAh battery. Even with those number seeming so clear-cut, we've got different screen sizes on these two phones, as well as different processors, and that's going to have a big impact on just how far those batteries can be stretched. 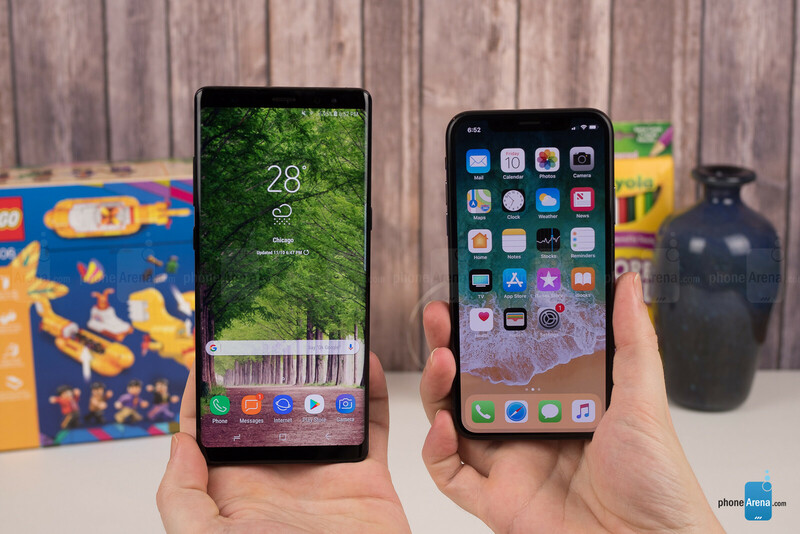 Running our same custom battery test on both handsets, the iPhone X managed to endure for over eight-and-a-half hours, while the Note 8 tapped out in just under eight; Apple wins, but these two phones are still operating in very similar ranges, and personal preferences like screen brightness or even using the Note 8's always-on display could end up having a huge impact in putting one phone more firmly over or under the other. 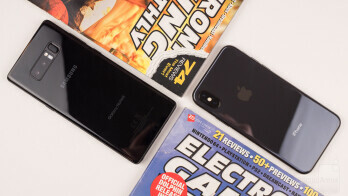 Both phones support wireless charging this year – a club that Apple's new to – but the more interesting story concerns regular old wired charging, as the Note 8 refills its larger battery in just over half as long as the iPhone X, which takes over three solid hours to recharge with Apple's included adapter. After the Note 7 fiasco, we'd forgive Samsung for not wanting to push any limits when it comes to its batteries, so it's doubly nice to see the Note 8 performing so strongly here. 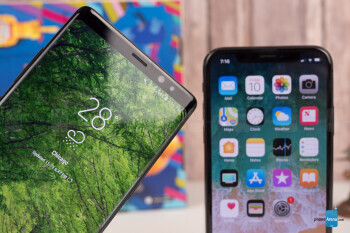 When you're spending around $1,000 for a smartphone, you're going to want to have a lot to like – and both of these handsets very much deliver. They're at the top of their games in performance, camera quality, visuals, and offering software that feels custom-tailored to this unique hardware. But make no mistake: neither of these phones is a good deal. You're absolutely paying a premium for big, face-filling screens, eye-catching aesthetics, and extras like the Note 8's stylus and the iPhone X's TrueDepth camera. If you simply like Samsung or Apple phones, the Galaxy S8 or iPhone 8 will leave you plenty satisfied for hundreds less. These phones, though, are for the super-fans: users who want to have it all, to feel ahead of the curve, and have access to features that are simply out of reach for more budget-conscious smartphone shoppers. There's nothing wrong with any of that, so long as you're comfortable footing the rather hefty bill associated with it. For a lot of shoppers, the choice between the Note 8 and the iPhone X will come down to platform, and whether you're an established Android or iOS user. But if we're ignoring those preconceptions, the Note 8 has the advantage of its stylus, a slightly more natural-feeling camera, and much faster recharge times with its bundled adapter. The iPhone X, meanwhile, is a more comfortable phone to carry and use, and has the performance edge. Maybe neither of these phones is for you, and the extras can't quite justify the expense. But if you're not afraid to fly a little close to the sun, these two offer some of the brightest, most satisfying smartphone experiences you can find anywhere today.